Around 330 species of the parrot family have been recorded throughout the world, extending from the tropics to the subtropical and colder parts of the Southern Hemisphere. Of these 30 species are endangered mostly due to habitat destruction and the illegal collecting of eggs and chicks for the bird trade. The parrot family includes cockatoos, lorikeets, rosellas, ringnecks and budgerigars. There are 56 species found in Australia, and only five of these are found elsewhere in the world. 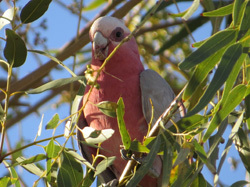 Some of the Australian cockatoos (bigger parrots) have declined as forests have disappeared since European settlement while others, like the Galah have benefited from new supplies of grain and water and have also expanded their ranges into urban areas. The Corella, Gang-gang and Major Mitchell have not fared so well. Found throughout most of Australia the Galah these beautiful bright pink and grey birds have become an icon of our native bush and like to live chiefly on inland plains with belts of timber or trees bordering watercourses but are also found in a wide variety of environments – including deserts, rainforests, mountain ranges, flat grasslands and coastal areas. With the drought many have become more nomadic and greater numbers are heading towards our greener coasts and urban areas to find food and water that is becoming increasingly scarcer in the drier zones. 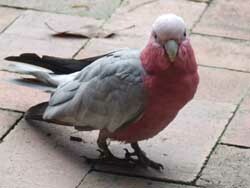 Galahs are gregarious parrots and are often seen in flocks of 30 up to 1000 when there is an abundant food source. Living in such large groups does have advantages, safety being the most obvious one, with a few birds watching out for danger while the rest of the flock is feeding or drinking. They are usually locally nomadic heading off at dawn to range up to 15 kms to look for their food returning to their nests and flock at dusk. They are mainly Granivores (seed eaters) feeding mainly on the ground gathering seeded grasses and herbs, flowers, leaves, wheat, sunflower seeds, corn, insects and grubs but will head up into the trees to devour native fruits, nuts, blossoms, berries and seeds. Because seeds make up a large part of their diet their beak has to be tough enough to crack open shells. It is also used to hold onto branches when climbing. The beak grows continually, and by chewing on hard material such as seeds and branches, a parrot can keep the size of its beak under control while keeping the cutting edge sharp. They have hard, rough tongues which move the food around in their beaks. They also have very dexterous feet and toes, with two toes facing directly forwards and two facing backwards on each foot, which helps them to hold food when eating and hang upside down to get at tasty food on the under side of branches. 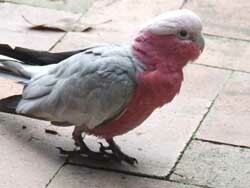 Galahs are the only native bird or animal known to use the poisonous paddy melon. (Generally only sought out in drier times) They split the melon, continually wiping their beak in the soil while opening it creating a barrier to the sticky toxic substances and exposing the inner flesh and seeds, to the drying effect of the sun. Once split open the fruit is left to dry, the birds return to eat the dried seeds with no risk of poisoning. Proving yet again that these are very intelligent birds! With a large head, short thick neck and compact bulky body, they are easily identifiable by their 2 strong colours (although size and colour variations occur from pale pink to almost red) with a bright pink neck and body, paler pink crest on head, shortish grey wings and tail, a strong short grey hooked beak, short thick grey scaled legs and toes, prominent eyes – males have brown eyes while the female has brown pupil but red/copperish iris. There are 2 subspecies that are distinguished by the ring or skin around the eye which is white in western birds and deep pink to red in eastern ones. Older birds can be determined by successive rings (of skin) around the eye, together with serrated edges to either side of the upper mandible (upper beak) and a deep “V” in the lower mandible. The adults can weigh between 300 - 320 grams. Chicks are born naked with fine pink natal down and are altricial (completely dependant on their parents). At 14 days old grey pin feathers start to develop and their eyes open. Parrots have no wishbone. Single-note screeches in contact, harsh screeching territorial calls. The various calls indicate warnings of danger, locations of food, distress calls and food-begging (especially when young). These calls are sometimes accompanied by movement, so that the flash of colours can become part of the message as well. In the breeding season August-November, earlier in north, they separate into pairs that are mainly permanent. A courting male will approach his mate with crest raised high and moving his head from side to side whilst uttering soft chattering calls to her. Although not territorial birds, each pair will defend their nest tree (living or dead and often a Eucalypt) which contains a hollow limb or hole 2-20 metres above ground and they will return to this same site year after year. (Nest holes in rocky outcrops and cliffs have been recorded) Several nests can occur close together and neighbours are tolerant of each other and visitors as long as they don’t come within 3 metres of the nest. Both male and female spend considerable time preparing the nesting hollow and site, chewing away bark and rotting wood from a large area around the entrance hole. Throughout the nesting season both male and female will also spend time wiping their beaks and faces over this bare entrance possibly to advertising ownership of the site. Nests used for a number of seasons become as smooth as glass around and up to a metre below the entrance. The talcum powder-like dust deposited from the bird’s feathers becomes impregnated into the timber making it slippery. It has been suggested that this habit is a defence against predators. 3-6 white oval eggs are laid on a bed of eucalyptus leaves with additional fresh leaves added to the nest during the 24-30 day incubation period to freshen and to increase the humidity. The male usually incubates the eggs during the daylight hours and the female at night. When the chicks hatch they are feed by both parents. After 6-8 weeks the young fledge and take their first flight where they are then taken to a communal nursery or crèche of up to 100 fledglings, usually in a protected clump of trees. For another 6-8 weeks both parents fly off to forage in the surrounding countryside flying back to the crèche where their young recognise their call and wait to be fed the regurgitated food. After this the young almost fully grown birds have to fend for themselves (the parents withdraw to the nesting area and complete their annual moult) spending their first 2-3 years in flocks of immature birds, which may wander 50 kms or more from their birthplace, especially during winter. Many young galahs are injured or die in their first summer while they are learning to fly on their own and this is the time when they often come into the care of WIRES, found concussed and often emaciated by a caring member of the public. Only 10 out of every 100 fledglings survive to their breeding age of 3-4 years old, but if they do, then they can live up to 60 plus years. To help these wonderful birds and all our magnificent Australian Native birds survive, plant Australian native flowering trees, shrubs and bushes in your gardens and parks and encourage our councils to do the same. Have a bird bath in a safe spot in your garden filled daily with fresh water for them to come and drink and bathe. Leave hollow logs and holes on trees to be used as nesting sites and enjoy their beauty naturally. More than 10 species have been listed as threatened in NSW. 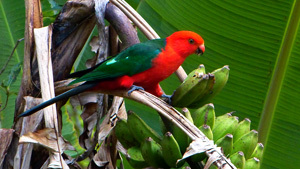 All parrots are legally protected throughout NSW by the National Parks and Wildlife Act.